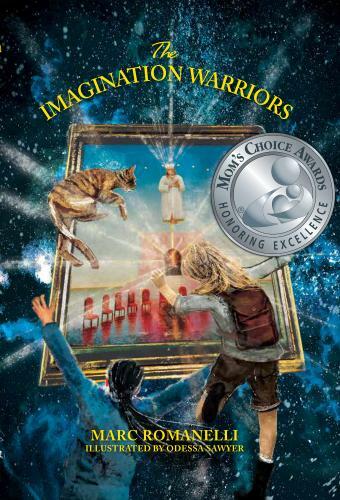 Mining the landscape of the village of Lamy, New Mexico, feisty and independent nine-year-old Philomena teams up with her grandmother’s psychic tabby cat to solve a series of mysteries involving curious paintings that begin to morph and change. Their investigations take them across time and space to worlds powered solely by imagination. Eventually the courageous time travelers decode the baffling paintings and discover that inspiration is the key; and the only tools necessary to take flight and soar are curiosity, imagination, and the stroke of an artist’s brush. Marc Romanelli lives in Lamy, New Mexico, an historic, authentic western village that was the site of a famous Fred Harvey hotel called the El Ortiz Hotel, which catered to railroad passengers traveling from Los Angeles to Chicago and stops in between. Marc lives with his three muses: his wife, Ahdina, their daughter, Philomena, their son, Redford, and, Bella, the German shepherd.